When last we left Chuck Norris, he was bumbling around the jungles of Vietnam, kicking as many people as possible. As our Chuck Norris double-feature concludes, we jump forward a couple of years into the onset of the ’80s and the glorious mess that is The Octagon (1980). In many ways, The Octagon is a great example of the “so-bad-it’s-good” school of filmmaking: featuring scads of anonymous ninjas, lots of kicking, more stereotypes than an old Disney cartoon and one of the worst voice-over narrations in history, The Octagon could never be considered a good film. That being said, it’s quite a bit of fun (providing one can turn their brain off) and is actually a better made film than Good Guys Wear Black (1978)…which, admittedly, is pretty faint praise. 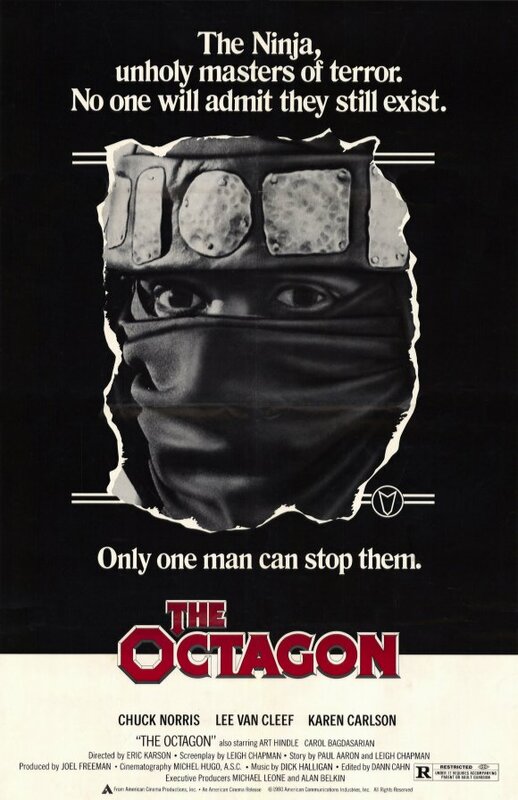 For lovers of bad cinema, however, The Octagon may just be a lost diamond in the rough. Wasting no time, The Octagon kicks off in truly gonzo form with an introduction to a school that trains terrorists: not just any terrorists, mind you, but one seriously clichéd group of terrorists. Let’s see: we get an Irish terrorist whose brogue is slightly more pronounced than the Lucky Charms leprechaun; a “soul-sister” with a huge afro; a cowboy, complete with 10-gallon hat and denim shirt; an Arab sheikh and a Mexican guy with a headband and flannel shirt (only the top button buttoned, natch). That’s right, folks: the film begins with the visual equivalent of one of those “X, Y and Z walk into a bar” jokes. With the bar set this high, astute viewers will realize something: it can only get goofier from here. And it does. Boy, does it ever. We first meet our dashing hero, Scott James (Chuck Norris), at the ballet. Chuck at the ballet? The mind boggles! Turns out Scott is there to pick up the lead ballerina, a feat which he handily accomplishes thanks to some simply stellar game: “I liked your performance”…”Thanks.”…”You’re welcome.”…long pause as they stare at each other. In case you couldn’t tell, this is what love feels like. Scott and the dancer head back to her place, which leads to the one development that no guy looking for a one-night stand wants: ninjas. Do you mean those silent, deadly assassins swathed in black from head to toe? Did I stutter? Of course I mean the black-clad killers or, as the film reminds us, “those unholy masters of terror.” The dancer’s place is full of ’em, which means ol’ Scott’s kickin’ foot has to work overtime. By the time he’s kicked at least 300 ninjas into submission, the dancer has already been killed. Bummer. When Scott turns on the light, however, he realizes the full breadth of the horror: the dancer’s family is lying dead, as well. This, of course, means that Scott would have had to meet the parents on the night of the first hook-up: yikes! Scott’s voice-over, however, knows what this really means, as it dramatically whispers, “Oh my God…Ninjas!” The “Ninjas” part even has an echo effect on it because…you know…ninjas! We then get some flashbacks which establish that Scott and the leader of the terrorist training school, Seikura (Tadashi Yamashita), actually grew up together but were forced to become enemies after their master basically told them to hate each other. Brother against brother for a reason? Sad times. Brother against brother for no reason? Let’s just say that Seikura ain’t cool with that (although poor Scott just seems bemused, most of the time). We also get to meet a few of Scott’s friends, including A.J. (Art Hindle), McCarn (Lee Van Cleef) and Quinine (Ernie Hudson). Lee Van Cleef’s very presence in the film should elevate it several miles above similar dopey fare but, alas, he ends up being fairly misused despite his inherent asskickery. Ernie Hudson actually fares much better, despite his lack of screentime. In fact, Hudson’s few minutes of screentime are actually the highlight of the film (give or take a really nifty car chase) and I really found myself wishing this was a buddy picture instead of a ninja-kicking picture. Maybe in an alternate reality. Of the three, we get saddled with A.J. the most, given that he’s also Scott’s best buddy. Unfortunately, he’s also a fairly uninteresting character, which is kind of a downer. Onwards and upwards, however! Lest we forget about the reason for the season, all of the aforementioned action is intercut with scenes from the school for terrorists which include such heartwarming bits as exercises, battle-training, some sparring and a seriously sinister red-clad ninja asskicker. After the training, Seikura tells the terrorists that they will now be watched for the rest of their lives. If, at any point, they attempt to tell others about the school or reveal its secrets in any way, not only will they be killed, but their entire families and all of their friends will be massacred, as well. After delivering this rather harsh dictate, Seikura and the other trainers then wave happily at the terrorists as they leave: no hard feelings guys, see you next summer and stay totally fresh! Honestly, there’s not much more to say about the film than what’s already been said. The Octagon is goofy, full of plot holes, loaded with silly kung fu scenes and ridiculous dialogue, flagrantly un-PC and severely dated. It’s also fast-paced and surprisingly likeable, although the ridiculous whispered voice-over narration spoils any attempt the film makes to take itself seriously. It’s impossible not to burst out laughing when you hear Chuck Norris whisper, “Oh my God…Ninjas!” The voice-over is everywhere in the film and almost makes it seem like poor Scott is schizo and keeps hearing whispery Chuck Norris in his head. Thanks to this handicap, the film is never any better than an enjoyable, silly kung fu film. Gotta dig Ernie Hudson, though! After my experiences with Good Guys Wear Black and The Octagon, I might need to delve into the mystique of Chuck just a little deeper, cuz I ain’t seeing much cinematic evidence to back it up. Sure, he was a total bruiser in Bruce Lee’s classic The Way of the Dragon (1972), but he’s almost a non-entity (albeit an exceedingly good-natured one) in both GGWB and The Octagon. I know that I enjoyed both Lone Wolf McQuaid (1983) and The Delta Force (1986) quite a bit when I was growing up but I don’t recall ever seeing the others. Since Delta Force also featured Lee Marvin, who could make tissue paper awesome, I’m not sure that I can give the victory to Chuck on that one, either. Perhaps the future will call for a Chuck Norris movie marathon, in order to settle my internal debate vis-a-vis Chuck’s cultural immortality. Chuck Norris may be able to cut through a hot knife with butter but he couldn’t do a whole helluva lot for either Good Guys Wear Black or The Octagon.